Houseless residents can drop off and pick up their belongings at the Warming Center’s front desk between 8-10 a.m. and 5-7 p.m. daily. Photo by Lluvia Moreno. Soaking wet clothes. No dry place to go. A good chance of contracting an infection or developing a rash. These are some of the realities the Santa Cruz houseless face this winter. Santa Cruz experienced 3.5 more inches of rainfall in December 2018 than in December 2017 and about one more inch in January 2019 than in January 2018. The degree of rainfall this winter increased the need for more warm spaces and hygiene services for houseless residents. About 80 percent of Santa Cruz houseless residents are unsheltered, and the city does not fund the few laundry services available to houseless residents. Two of the four public restrooms downtown are port-a-potties that are almost always dirty. There is only one port-a-potty between Pacific Street and Front Street, and the next closest one is four blocks away on Locust Street. Santa Cruz received about $9.2 million for immediate use from the state last year to fund houseless services. Thirty-five percent of the budget will be used for capital improvements. A significant portion of that will be allocated to housing infrastructure projects. The money is set aside for one-time use, meaning it will expire at the end of two years. 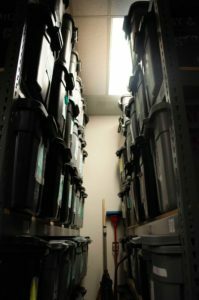 In the past, city funds directed toward houselessness have not significantly changed the amount of storage or shelter space available. Local activists like Brent Adams, director of the Warming Center Program (WCP), stepped in to fill the gap. The WCP serves as a temporary overnight shelter space on cold nights and has a storage program that allows houseless individuals to store their belongings in a dry and secure location for up to 90 days. “My role is really to find where the needs are that aren’t being met by the millions of dollars spent [by the city], and how can we, with almost no money, seek to meet some of those,” Adams said. The city does not have any available storage facilities for the houseless at the moment, so the Warming Center is all people have. 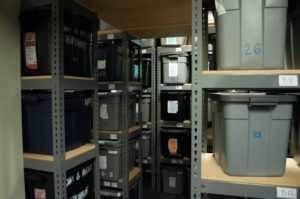 The WCP office on Felker Street, across from the River Street encampment, has bins for 225 people stacked from the floor to the ceiling. Houseless residents like Bengtson have been living in tents at the encampment by the Highway 1 entrance for weeks, some for months. Lately there have been drainage issues, which make it difficult to stay dry and warm inside tents. The makeshift River Street encampment sits on land under the jurisdiction of the city, the county, the Santa Cruz Police Department and the California Department of Transportation. This separation of powers blurs accountability, but it also highlights multiple targets for a potential class-action lawsuit, Bengtson said. The shared responsibility of the River Street encampment reduces the incentive of any one party to take action on matters like drainage issues. Another houseless resident, Thomas, who preferred to give only a first name, and Bengtson feel the city and community have not prioritized the needs of houseless residents. The effects of cold and wet weather combine with the experience of houselessness to create a demoralizing environment. Through donations, FNB supplied 450 sets of rain gear, 250 pairs of boots and 150 tarps to houseless residents this winter. McHenry said the relief of these donations brought some individuals to tears. Houseless residents and community activists like McHenry and WCP director Brent Adams have been pushing the city to fund more shelter spaces, laundry facilities and bathrooms, but little has been done thus far. Bengtson took it upon himself to create drainage at the River Street encampment by digging trenches. Without much city or community support, he is having a difficult time keeping up with the problems. City officials and members of the community often treat the houseless as second-class citizens, McHenry said. Many people are not aware of just how difficult it is for someone to be houseless in Santa Cruz, especially during winter. The storage center on Felker Street is packed with belongings and only accessible for a few hours each day. Photo by Lluvia Moreno.